Upsets continue to be the order of the day at the ongoing 2016 Shanghai Masters. A day after Rafael Nadal and Tomas Berdych were shown the door, three more seeds fell on Thursday in the third round. 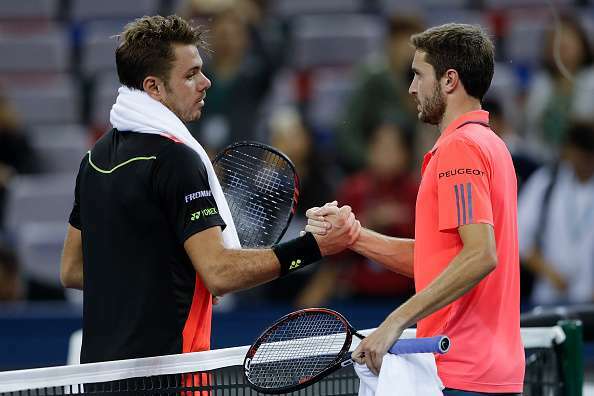 Third seed and US Open champion Stan Wawrinka was the biggest name to exit the tournament and was joined on the sidelines by the fifth seed Milos Raonic as well as the sixth seed Gael Monfils. Wawrinka was far from his Grand Slam-winning self and squandered a 3-1 lead in the first set to lose 4-6, 4-6 to French veteran Gilles Simon in 1 hour 36 minutes. Simon secured four breaks of serve in this contest while the error-prone Swiss had only two breaks of serve. World No. 25 Jack Sock’s resilience was the biggest talking point of the day. The American was pummelled into submission by the fifth seeded Milos Raonic in the opening set which the Canadian went on to win 6-0. But Sock rebounded from that disastrous first set in stunning fashion to eke out a 0-6, 6-4, 7-6(8) win in 1 hour 53 minutes. Sock saved a match point at 6-7 and 7-8 in the third set tie-break after withstanding a barrage of 14 aces from Raonic. This was the Rio Olympic mixed doubles gold medallist’s first win over the Canadian after eight consecutive defeats. He now goes on to meet Simon in the quarter-finals. Later in the day, 11th seed and Japan Open runner-up David Goffin prevailed over the sixth seeded Monfils, 4-6, 6-4, 6-2. Meanwhile, there was no stopping the world’s two best players. Both Novak Djokovic and Andy Murray put up solid displays in their respective third round matches. Second seed and China Open champion Murray looked devastating in his 6-1, 6-3 win over the 13th seeded Lucas Pouille. The top seeded Djokovic has come back to the Tour after an elbow injury forced him to pull out of the China Open last week. But he too looked equally impressive in his 6-4, 6-4 victory over qualifier Vasek Pospisil. The Serb broke his opponent three times in this match. While Murray next faces Goffin, Djokovic will take on qualifier Mischa Zverev in the last-eight. The latter’s younger brother – the rising star Alexander Zverev – however, was denied a quarter-final berth despite being very close to clinching one. The 19-year-old was ahead 4-1 in the final set but could not prevent a late surge from the ninth seed and 2015 runner-up Jo-Wilfried Tsonga, who came back for a 6-7(4), 6-2, 7-5 win.